Business analytics is used to evaluate and optimize business operations. Computer science, math, and business skills are required to provide a well-rounded look at a company and the data behind it. With an increasing demand for business analysts, graduates can expect a wide array of employment opportunities. There are different types of business analysts, and they all perform slightly different tasks. Specializations appeal to certain career and personal interests, such as math, computer science, or business. BAs help prepare finances and monitor spending through predictive software. What is Big Data and Why Does it Matter? Big data is data sets that are too large to sort through just by looking at them. These data sets need to be analyzed and broken down through programs into digestible reports that are then presented to management. The volume of data available to companies is larger than ever, and continuing to increase. Companies must hire business analysts to sort through this large amount of data and transform it into reportable action items. 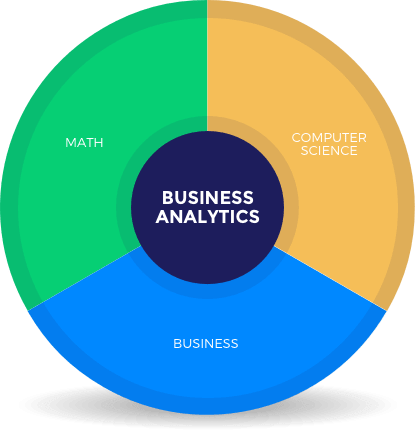 To become a business analyst, students must develop skills in different fields, which they can acquire through a degree in business analytics. Due to the growing popularity of this career, more schools are beginning to offer this program in traditional and online formats. Visit our degree pages below to learn more about available programs. Looking to advance your career in business analytics? A master's degree can help graduates obtain higher salaries and more job opportunities. A certificate in business analytics can be an alternative to a traditional degree program and can be a boost for analytics employees careers.